I’ve seen quite a few funny posts on social media recently about how the majority of us go all out and get dressed up on Christmas day to essentially just sit in our living rooms. I’ve never actually thought that much about it before but it is actually quite hilarious that we do it. Is it just to celebrate the occasion? To show off our fancy new presents? Then the other half of people tend to stay in their PJs all day which I’ve never actually done before but I’m tempted to this year! Despite my low-key plan to stay in my PJs, it’s still very likely I’ll put a full face of makeup on. Just to make myself presentable for any cheesy family photos and make myself feel a bit nicer of course. I thought my Christmas eve post was the perfect time for me to put up a glitter look that might inspire your Christmas day makeup. 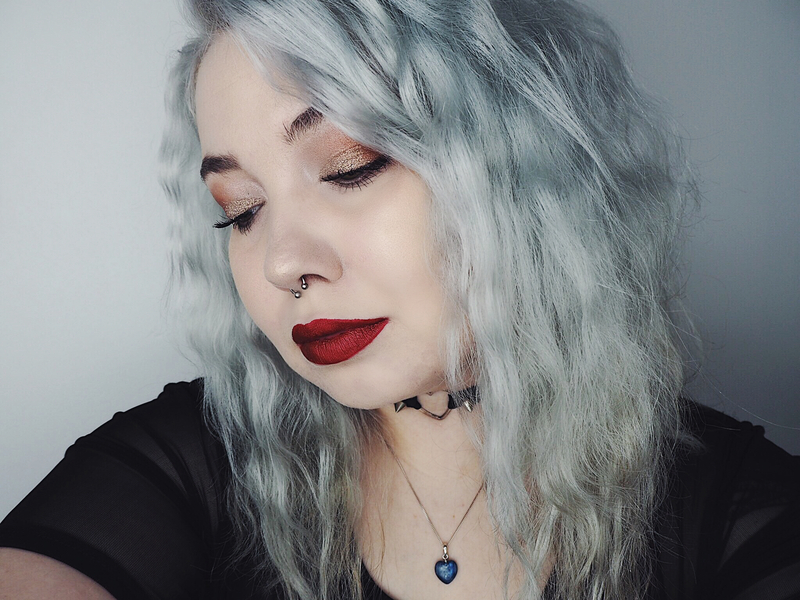 I am using some new fabulous products that I’ve only recently discovered too so I really wanted a chance to rave about them! I managed to pick up the NYX HD concealer in shade “00” (the palest of course) for £3.99 in B&M which is a complete steal as it retails elsewhere at £6! The formula isn’t too thick at all, it covers blemishes really well and combats redness. Then I’m using Maybelline Fit Me Foundation in shade “100” which is my favourite drugstore foundation at the moment, the coverage is amazing and it leaves your skin with such a lovely glow despite it being marketed as matte. And then The Body Shop’s All In One Face Base in shade “03” which you can read more about in my post here. For contour I decided to use the Kat Von D Shade & Light Contour palette and then reached for my Anastasia Beverly Hills Glowkit (seeing as it’s Christmas!) in “Sweets” and then the shade I used in the kit was “Butterscotch” as I wanted a gold highlight to go with the gold eye glitter. On my lid I’m using top left shade in the Morphe 35F palette as an iridescent white-ish base and then the 4th shade down on the far left in the same palette on the outer corner which is a lovely copper colour. I’m then using the dark browny plum shade just below it on my under eye to smoke the look out a little. The gold glitter I used is the Collection Glam Crystals Gel Eyeliner in the shade “Funk”, this is perfect as an eye glitter as once you let it dry it doesn’t print, it stays on the lid so well even without a primer and isn’t chunky or uncomfortable at all. The mascara I’m using is the trusty old Maybelline Lash Sensational of course. Last but not least I’m wearing one of The Body Shop’s Metal Lip Liquids on my lips in the shade “Plum Titanium”. You can read my recent post about these here too. Well I hope you enjoyed this look and have the most wonderful Christmas Day! I am so excited to spend the day with my family and the evening with my boyfriend. How are you going to spend your Christmas? Natural Based Nourishment With Hempz! "The Body Shop Metallic Lip Liquids!" I love this look! It’s super festive, I love it and it suits you soo well. You’re soo talented with your looks and I love them. Wish I could replicate something like this. This year, i’ll be spending Christmas Day with my parents, sisters and my little puppy dog. Then Boxing Day a second Christmas with my Uncle, I’m soo excited as it’s going to be an unusual Christmas for me! Love it! So smouldering and Beautiful ? Little bit obsessed with your makeup! ? and what a steal on the NYX concealer – I love that concealer and am loving the lip paint you posted about from the body shop! I’ll be dressing up for tomorrow too as I’d rather look presentable in photos ?? Wow, don’t you just look incredible?! 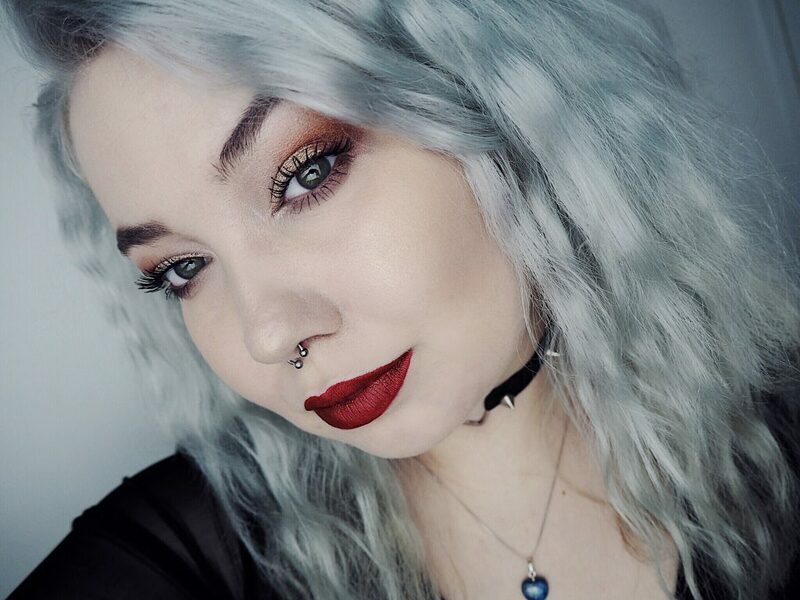 This is the perfect festive look, I love the gold and glittery eyes combined with the bold lip! Your base is absolutely flawless, I need that NYX concealer in my life! Gorgeous post by a gorgeous lady! Happy Holidays to you! This look is so pretty! 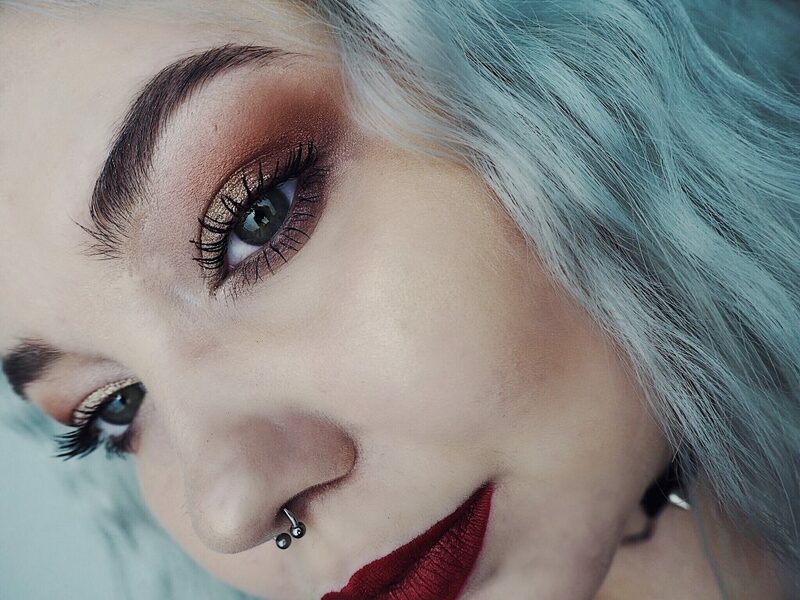 I love the colour of the lipstick and the eyeshadow! I bought the Collection glitter eyeliner a few weeks ago, they are always so good and aren’t too expensive either – it’s great! Loved this look. Lips are fabulous and intense! LOVE LOVE LOVE LOVE this look! 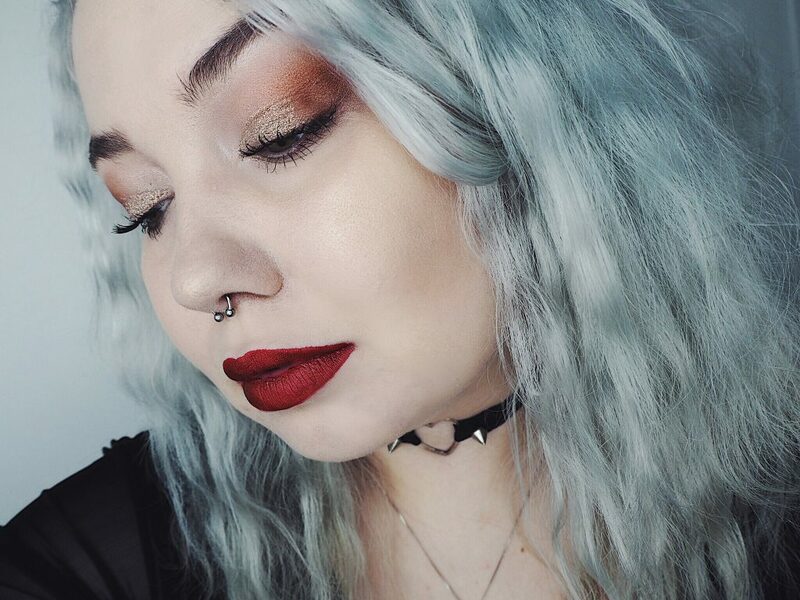 gold eyes and a red lip is one of my all time fave combinations, so perf for christmas too! It’s such a beautiful look! You look amazing. Suits you perfectly! I love the shade of your lipstick, it’s great for Christmas. Your eye makeup is so incredible! 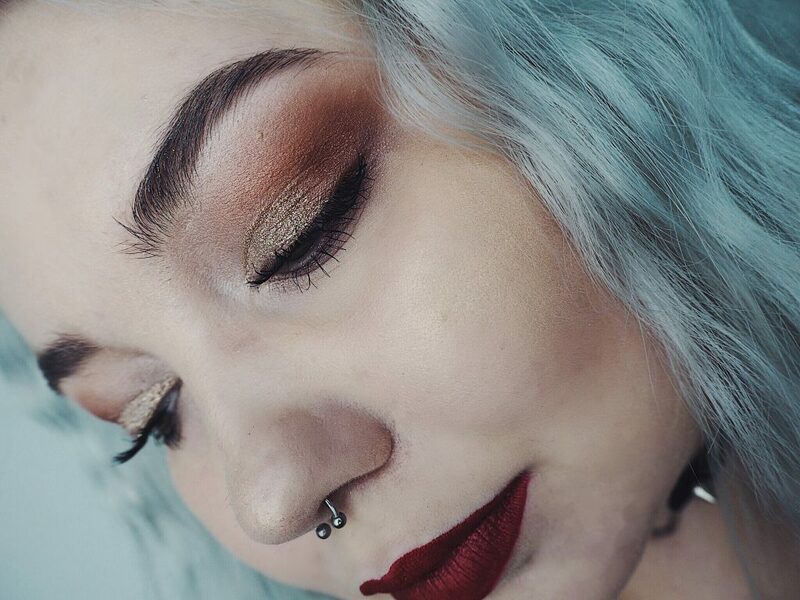 I love the metallic looking shades and how you blended them together! Such a stunning look!